Small blue booklet, black writing and local district map showing Girgarre East,Tongala etc. Folder containing personal letters from Sgt R. Bray to his wife Mary. personal letters from Sgt R. Bray to his wife Mary from Camp 4 Tatura. Tatura Bowling Club, Division 1 Premiers 1964/65.|Back: G. Dunlop; E. Davies; J. Maskell; S. Moore; A. Bailey; F. Volk; R. Rose; L. Green; A. Knee; K. Warburton; H. Payten.|Front: D. Hoffman; W. Dunlop; J. Coombs; A. Davies; G. Hicks. Tan linen finish cover. Cream letters Cream back cover. Acknowledgement: Mary - Clare Adam daughter of Leonhard Adam. Small brown covered booklet, black writing. Sketch of Scout in hiking gear on front. Scout Emblem and kangaroo, Australian Jamboree, Frankston, Vic 1935 on back cover. Ledger of Tatura Coursing Club 1963 - 1964. Including memberships. Photographs taken by Leo Baker in 2001. Originals in his possession. John Stephen Hill came to Tatura in 1912 and became Manager of the Tatura Free Press in 1916. 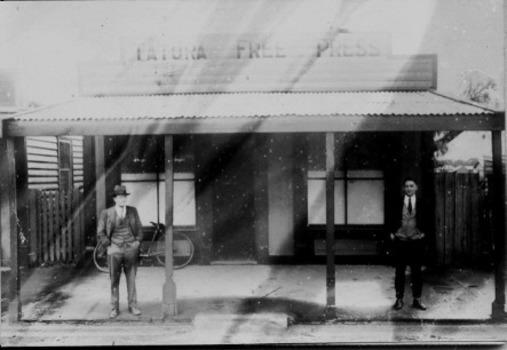 He died in 1953 having being very involved in community affairs throughout his life in Tatura.|Photo features two men posing in front of the Free Press, with a bicycle in the background. Short sleeved ribbon embroidered dress. 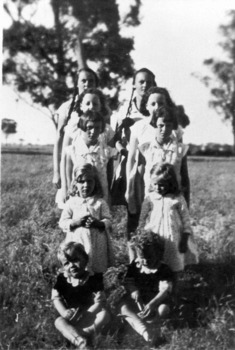 Black and white photograph of a group of 13 boys with Captain Jenkins. A junior Re Cross group. L-r: Captain Jenkins back row Bruno East, Adolf Lin, Sgt Maier, ?. Front: Ernst Lewandowski, Manfred Haering, Ernst Wied. Each boy wears his Junior Red Cross badge on his left breast. Colour photo of a caricature painting by Hans Walter von Gruenewaldt depicting female highland dancer. 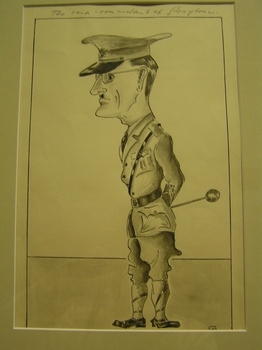 Hans Walter von Gruenewaldt was a German POW who used his artistic ability to paint several large mural caricatures while he was held at Camp 13 at Murchison. The technique he used was colourful house paint, painted directly onto the walls of the German mess hut, reading room and recreation hall in compound 13D. The paintings were completed over a duration of six years (1941-1946). This object is a wooden box with a divider in the middle which contains the wooden chess pieces. Black pieces and brown pieces. Contains 31 pieces for the chess set. One piece went missing, at some point (brown pawn). 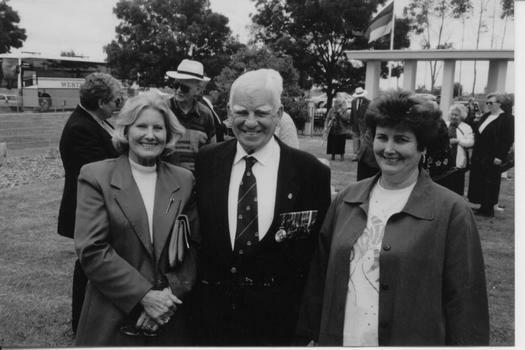 Mrs and Mr Bruce Ruxton, RSL President at German War Cemetery November 16th 1997; with friend. Black and white photograph of head and shoulder of Captain Jim Sullivan. His legendary kindness to the Japanese children is a proud record of human relations. Black and white photograph of the inside of the Museum. Dieter Ruff and Mrs Lilo Thaler standing inside the mock hut celebrating the 50th Anniversary, September 1991. Photographed at Tatura Museum of 50th anniversary of Templers return. Soft cover book. Reprints of photos of various people and families on front and back covers. Coloured and black and white photos. Text in French and Japanese. Titles of book printed in Red. 22 group photographs of Tatura organisation on double page supplement. Tatura Guardian Newspaper 8 September 1960. Included are: Apex, Shire Councillors, Show Society, RSL, Plumpton Coursing and Racing, Football, CWA, Fire Brigade, Younger Set, Croquet, Red Cross, RSL Auxiliary, Kinder, Golf, Council Staff, Young Farmers, SS Mothers Club, Hospital Auxiliary.